Come explore Nepal’s ancient history with the Himalayas as a backdrop. Wedged between the high Himalaya and steamy Indian plains. 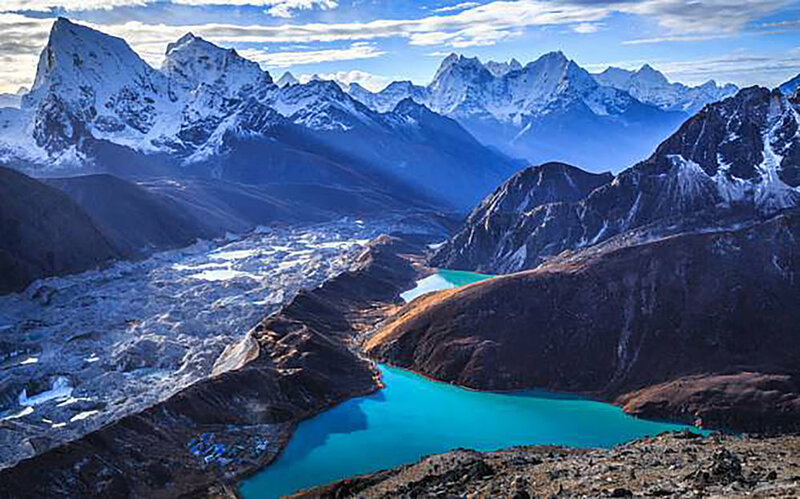 Nepal is the land of snow peaks and Sherpas, yaks and yeti’s monasteries and mantras. Kathmandu offers a collection of world-class palaces, hidden backstreet shrines, and sublime temple art. Don’t forget Thamal street - a Disneyland for backpackers! You can learn how to make the best momo’s or everything about Tibetan Buddhism. The Nepal Himalaya is the ultimate goal for mountain lover and photographers alike. Some of the Himalaya’s most iconic hiking is offered here, with rugged trails to Everest, the Annapurna and beyond. Nowhere can you trek for days enjoying the silence and beauty of the mountain scenery, knowing that a hot meal, cosy lodge and warm bed awaits you at the end pf each day. You will feel that traditional mountain life flows at a slower pace, allowing you to be in the moment all the time. Giving you time to capture memories that will last a life time. The biggest problem you may face in Nepal is how to fit everything in, which is why you may find yourself returning again and again. Come immerse yourself in the Nepalese culture, enjoy stepping out of the familiar! Use the contact form or call us at (603) 731-8673 to learn more about our Nepal treks. Contact us now to ensure the best pricing and widest selection. It's risk free - your deposit is 100% refundable while you gather your group. "Thank you for the trip of a lifetime! Going to Nepal may be one of the best things I've done. The memories are innumerable. You have given me the confidence to travel more on my own."